There are enough maintenance issues on a car to keep any driver occupied. Whether it is finding the next place to get an oil change or what type of insurance to buy, it can become a full time job to keep a car running safely and legally. Luckily for residents of Southern California, there is now one less thing to worry about on their vehicles with PG Auto glass repair in Los Angeles now offering affordable deals to all customers. When it comes to repairing or replacing auto glass, many drivers decided to let those cracks or dings go unnoticed. Unlike cosmetic damage to the body of a vehicle, damage to auto glass can become a very serious safety issue and PG's fleet of mobile auto glass repair vehicles can fix these minor damages before they become a serious problems later on down the road. Cracks can occur through flying debris on the road or even everyday stresses. If left untended, cracks can lengthen from moisture in the air, jostling on the road, or even temperature changes between night and day. For drivers that are facing this problem, PG's mobile auto glass replacement in Los Angeles is now offering a $10 online discount to make this decision just a little bit easier. 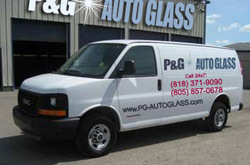 PG utilizes only the highest grade of materials for all of their mobile auto glass replacements. Their OE replacement glass is made to match or exceed all federal safety standards and is created to the exact specification of the original manufacturers, meaning a better fit. On top of their Los Angeles auto glass replacement deal, PG also offers free estimates on all work, 24 hour services, and a lifetime guarantee. For those that have been on the edge about their own Los Angeles auto glass repair or replacement, now is the time to make that call. No longer do drivers need to let those cracks or nicks on their auto glass remain as an unsightly and dangerous addition to their vehicle.